Is There a Speed Bump Ahead for XPO Logistics? The freight transportation and logistics leader may be able to steer around the growing shortage of truck drivers. 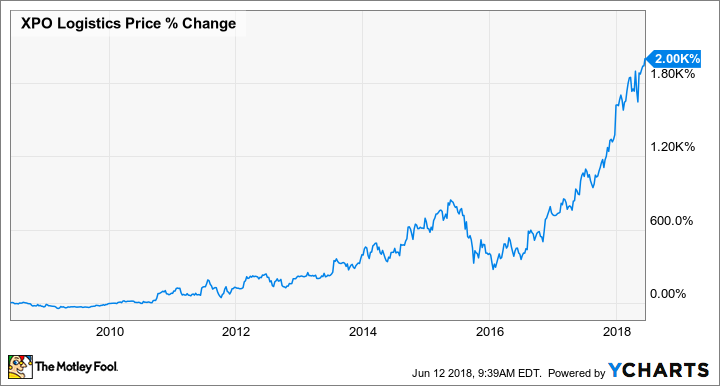 XPO Logistics (NYSE:XPO) has been a phenomenal growth story: Over the past decade, its shares have returned 2,000% to investors as demand for freight transportation and logistics services skyrocketed. Yet there's a worsening driver shortage in the trucking industry that could throw off the company's momentum. Will it put the brakes on XPO's growth, or might it turn out to be an opportunity for it to gain a competitive advantage? Data from the American Trucking Associations (ATA) reveals there's a shortage of 51,000 truck drivers across the country today, a shortfall that is forecast to worsen dramatically over the next few years to some 100,000 by 2021. Because virtually every part of the U.S. economy relies in some measure upon the trucking industry, reports of rising transportation costs due to the shortage are creeping into corporate earnings reports. For example, Hasbro CFO Deborah Thomas said on the toymaker's first-quarter conference call with analysts that higher freight expenses are "really coming from the trucking industry and higher due to the new electronic logging device rules and driver shortages." Jeff Miller, CEO of oil industry services giant Halliburton, called the trucking industry his company's second-biggest "logistics bottleneck." "The issue today is not in tractors and trailers," he said, "it's finding qualified drivers and dealing with congested infrastructure." In part, the industry's problems stem from good news elsewhere: The economy has continued to expand, the official unemployment rate is at its lowest level in 50 years, and consumer confidence is rising. While all of those things are positives, they've led to a ramp-up in demand that is beginning to strain the capacity of the transport industry. So far in 2018, truck tonnage has surged 8% year over year, far outstripping the 3.8% gain experienced in all of 2017. Nearly 71% of all the freight tonnage in the U.S. travels via truck, which requires more than 3.5 million truck drivers to move it. The growing shortage of drivers is a problem not only for retailers but for the trucking companies themselves. XPO Logistics is the second-largest freight brokerage provider globally, and the leader in Europe and North America, where it's also the largest provider of last-mile logistics for heavy goods. XPO is also the top manager of expedited shipments, and the No. 2 provider of less-than-truckload transportation. Although it too is feeling the pinch due to difficulties finding qualified drivers, it's also benefiting from the capacity and networks it added over the years through its growth-by-acquisition strategy. Its last major acquisitions were in 2015 when it spent $3 billion for Con-way and $3.5 billion for French trucking outfit Norbert Dentressangle. Though its now rumored to be a takeover target itself, XPO last year said it was setting aside as much as $8 billion for additional acquisitions. XPO now has relationships with over 50,000 carriers with total fleet of more than 1 million trucks, and it's leaning on its technological prowess to capitalize on all available capacity. It recently launched Drive XPO, a mobile app for brokerage carriers that allows drivers to bid on and manage loads from the road. It also added XPO Connect, a cloud-based digital freight marketplace that gives its customers visibility into pricing across truck, rail, and drayage, allowing them to see their best options in real time. Yet at some point, the trucking industry will have to confront the driver shortage, and to do that, transportation companies will have to raise what they're paying above the current average annual salary of $53,000, according to the ATA. XPO had to raise wages for truckers by as much as 5% in the first quarter, but the number of daily shipments fell by a like amount as it choose to take more profitable loads instead to compensate as costs for freight brokerage and last-mile delivery jumped year over year. XPO is looking to technology to make a difference by capitalizing on the growth of e-commerce and the worldwide supply chain. It recently launched XPO Direct, a shared-space distribution system that lets retailers use its technology, trucks, and workforce so they can be competitive with Amazon.com, but don't have to build out their own distribution centers. Equally important, it allows XPO utilize its capacity more efficiently, and as it opens more hubs for last-mile delivery, pass along its higher costs across multiple partners. XPO revenues rose 18% in the first quarter, driven by organic growth gains of 11% overall, but 15% in last mile and 30% in freight brokerage. And despite its higher costs, operating income rose 32% while earnings before interest, taxes, depreciation, and amortization was 20% higher too. Because technology may very well be the differentiator between those who succeed and those who fall by the wayside, XPO Logistics should successfully navigate the rough road ahead.